Scarcely a day passes without news headlines globally decrying the irreversible damage being done to the environment by people's consumption habits, with plastic now a special cause célèbre to add to worries including climate change and loss of biodiversity. In the past year, we have gone from discovering the true extent of plastic pollution in oceans and fresh water to most recently, research revealing that microplastics are moving through the entire food chain, and into our bodies. Meanwhile, as politicians and business leaders grapple with climate change, most recently coming together in the United Nations' COP24 conference in Poland, water scarcity affects ever more people, with over half of the world's population predicted to be affected by 2050. It's little wonder that sustainability is a major concern to companies of all sizes and has become central to business models and the way organizations conduct business today. Madrid-based Auara, a startup with sustainability at its core, attempts to tackle the double scourges of plastic pollution and water stress: the former via the product it sells, and the latter through its collaborations with NGOs providing water access to vulnerable communities. Occupying a unique niche in the bottled water sector since 2015, Auara sells mineral water in bottles made of 100% recycled plastic, the first water brand in Europe to do so. Deciding on the bottles’ packaging material was a challenge. Auara's founders spent months researching the most sustainable option with the least environmental impact before settling on 100% recycled plastic, known as R-Pet, sourced from recycling facilities based in the south of France. "We analyzed the different options we had: glass, plastic and Tetra Brik containers," Auara's CEO and Co-founder Antonio Espinosa told CompassList at Madrid's South Summit 2018. "We saw that in terms of carbon footprint, plastic and Tetra Brik were much better than glass. In terms of potential waste, however, we discovered that Tetra Brik generates immense problems in terms of recycling since it is made of different layers of materials; you see paper on the outside but the inside is made with aluminum and also plastics. We thought plastic was a good option since we can produce bottles with 100% recycled plastic,” Espinosa explained. Auara’s research into packaging solutions has found that bottles made with bio-plastic derived from plant material, such as corn and potato starch, are biodegradable. This means that after these bottles are discarded, the organic material they are made of will decompose instead of turning into microplastic that will remain in the ecosystem. The startup's business model also has sustainability at its heart. From the onset, Auara adopted the social enterprise model, increasingly being adopted worldwide. Social enterprises are a hybrid of for-profit enterprises and traditional NGOs that sustain their activities through donations. Half of the profits from commercial activities have to be reinvested in social and environmental projects in a social enterprise, and each mission has to be treated with more or equal importance to financial goals. 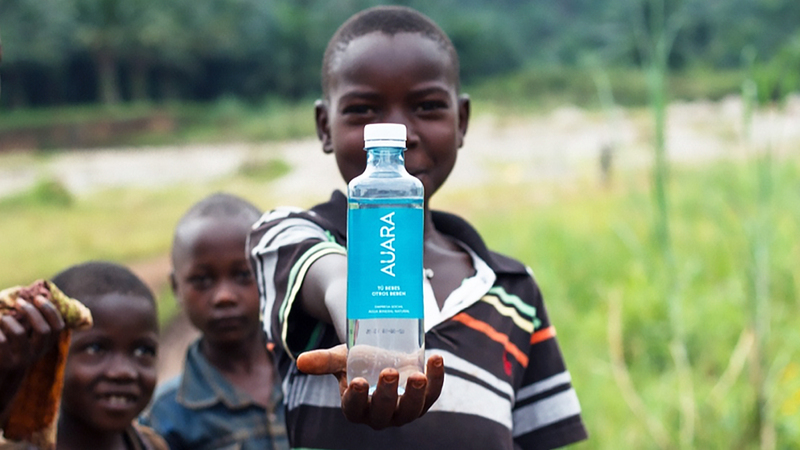 Auara's name is an Amharic word meaning “thunderstorm in a desert”, and, symbolically, that is what it creates by reinvesting 100% of its dividends in social projects that provide water in countries where it is needed, such as Ethiopia where Amharic is spoken. As a Spanish entity, Auara is operating in an economy that was among the first in Europe to regulate and supervise business activities with social purposes. Since 2016, the company has helped more than 15,000 people and has finalized over 24 projects in 12 countries with more underway. Each Auara project creates a real impact in a local community. Instead of simply contributing by donating to NGOs, the company works directly with local partners on a shared project, with a commitment to follow up for the next five years. “Today, there are a lot of amazing initiatives that are not working because of the lack of follow-up. For us, it’s important to ensure the long-term feasibility of the project," Espinosa told CompassList. Auara seeks to work with NGOs that are truly engaged in the local communities where the project is developed. The startup has a strict validation process that involves constant assessment of projects run by the NGOs in the past three years, along with audits that make sure partners are able to make effective use of funding. “We usually implement a schedule so that we don’t give all the money in one tranche; basically we try to bring in some concepts from the corporate world,” continued Espinosa. The model adopted by Auara – working in conjunction with local partners – aims to address the communities' real needs and demands. To do so, Auara empowers local organizations to act within the community and meet its needs while allowing the organizations to be fully responsible for the project and its development. “We ask for projects that the community is conscious they need. We don’t go there telling them what has to be done and how it has to be done; we listen to what the community feels is the real need for each project we are going to do” explained Espinosa. “Working through local partners enables you to have this indirect presence. Sometimes in our projects, local people don’t even know that it is Auara behind the project; we don’t necessarily put our name or logo on it as we don’t care very much about that." But Auara does face the challenges that most social enterprises come up against. In the retail setting especially, it can be a struggle competing with big players, like Nestlé, Danone and Coca-Cola, to deliver a social message and reach end customers without a marketing budget. “We really need to have a proposal that people value that is different to water because if we sell just water, we are done for,” said Espinosa. To this end, each Auara bottle is labeled with a QR code that informs consumers about the project they are contributing to with their purchase. It also publishes projects’ stages, costs and follow-up details on its webpage in a bid to be entirely transparent. The startup is considering expanding and diversifying its business by introducing new products. Auara’s water bottles are currently distributed through Amazon, El Corte Ingles, Carrefour, and Calidad Pasqual, the third biggest food and beverage distributor in Spain. Espinosa emphasized that a social enterprise has to take into consideration social, environmental and financial dimensions. Finding a way to balance these aspects can be hard. “What is happening to social entrepreneurs nowadays is that they are so passionate about the social impact that they tend to forget about the financial sustainability of the project,” he explained. Auara's story encapsulates ambitions and entrepreneurial challenges but also strong commitment, research, and investigation. While Europe, the US, and some Asian countries have paved the way for the continued growth of this social-entrepreneurial ecosystem, the path to building and expanding these activities is still challenging. “I believe that the good thing about social-entrepreneurship is that you’ve found something you’ve fallen in love with so deeply that you commit yourself very strongly to it. Entrepreneurship is hard and social-entrepreneurship is even harder,” Espinosa concluded.